Now you can finally stream your apps directly to Facebook Live from BlueStacks with the new BlueStacks Android emulator for PC. BlueStacks is even faster and gives you more control over the performance of your computer. You can now set your RAM and CPU, resolution and tons of other settings manually to make Android apps and games runs smoothly on PC Windows and MAC. Here you can see how to download and install BlueStacks with Facebook Live streaming feature on Windows PC & MAC desktop/laptop and Surface pro tablet. We are going to show you how you can install and setup BlueStacks + Facebook live for PC in a guide below. Before downloading and trying out new BlueStacks with Facebook Live, here’s what you can accomplish on new BlueStacks version. You can live streaming on Facebook Live in Windows 7, Windows 10, Windows 8/8.1 (32bit/64bit) & Mac OS X/macOS Sierra powered computers with the new BlueStacks for PC Windows & MAC. Previously you could live stream your apps and games on Twitch.tv from BlueStacks on PC. But now in this latest BlueStacks for PC download you get brand new Facebook Live streaming feature that lets you live stream your game-play and video chat at the same time to your Facebook Live contacts & friends from a single click on a new Facebook live streaming icon on the left tool bar. 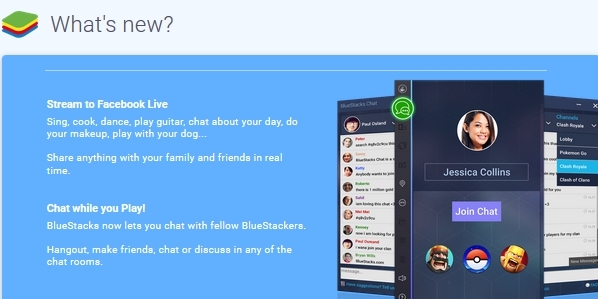 Unlike Twitch streaming on BlueStacks, you can choose to be seen by only your friends and family when streaming to Facebook Live on BlueStacks 2.5.55.6279. You can be yourself in front of personal audience on Facebook Live, which you could not do on Twitch.tv streaming. Sharing anything from personal talents or secret recipes to gaming or app tips to your Facebook Live audience while playing apps/games side-by-side. 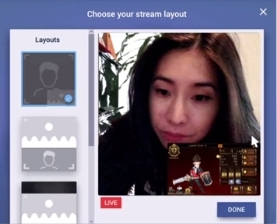 New stream layouts is one of the best features of the latest BlueStacks release. As more than 50% Facebook users access the site on mobile device, you can now adjust streaming layout to fit mobile screen display size. You can optimize viewing to your audience. As you may be aware that Facebook Live streams only display in square layouts to make it possible to optimize viewing space on mobile devices, as can be seen in the image below. The layouts Selector has many features inside for different purposes. Choose a layout to show your gaming skills or chat via webcam using messenger apps that allow video chats such as WhatsApp, Viber, Skype and more. Share cooking skills and recipes over live video links. You can change layout anytime during or after the live streaming session. BlueStacks for Facebook Live opens up new avenues for what you can share on streams from your computer. For that, just place your PC anywhere in your home. There is no need to worry about how far away you can hold your phone or by propping it at a perfect angle to get a wider shot. Now see who is liking and commenting on your video in larger displays rather than on smaller phone screens. 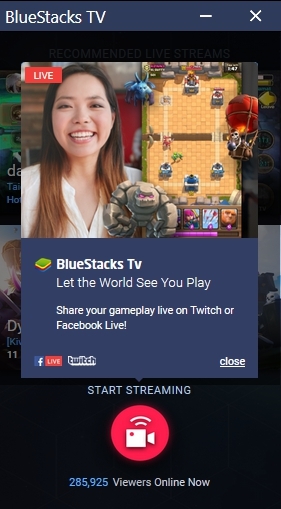 Just like you can control who you want to see your posts on Facebook, you can now decided who can view you live streaming on BlueStacks TV. With BlueStacks TV, you can stream to your timeline, your friend’s timeline, or your Facebook page. Along with these options, there are a lot more of similar advanced setting option in updated BlueStacks TV. Now you can see live chat text right next to the live streaming of games or apps screens. This feature has been brought over to Facebook Live, including chat and likes. 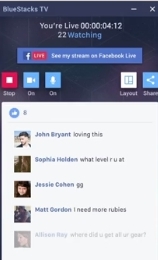 See who is commenting and liking your live stream without having to open up web browser in a separate window. – Added ability to stream your apps to Facebook Live with one click. You can stream to your timeline, your friend’s timeline, or a group or page you control. We’re excited to see what you stream next! Now Let’s see how to download, install and setup BlueStacks + Facebook Live on PC Windows and MAC. 1 – Download updated BlueStacks version from the link below and save the installer file on PC. Also, see BlueStacks 2 detailed setup guide. 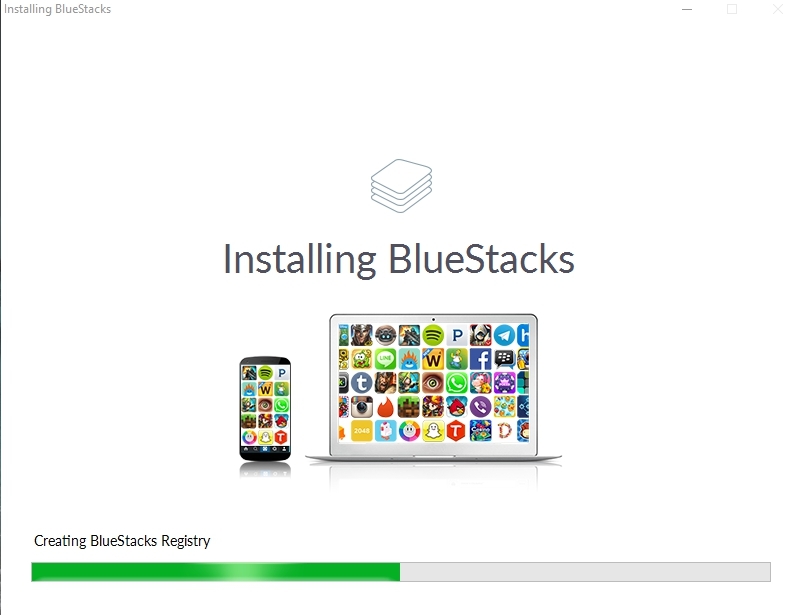 2 – Launch the BlueStacks installer file on your PC. 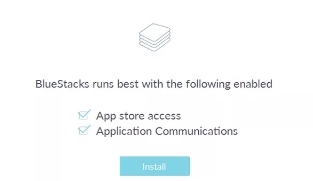 3 – Make sure to check the App Store Access and Application Communications options when asked during the setup and hit the Install button. 4 – Enter your Google Play Store account details or create a new BlueStacks ID when prompted. 5 – Wait for the installation to complete. 6 – Now open BlueStacks on PC and a screen similar to the one shown below will open up. Wait for the BlueStacks data to load. 7 – On the left tool bar in the above image, you can see two new icons in green and blue. Click on the small blue color button to start Facebook Live streaming which will start live streaming box on the right of the main BlueStacks interface. 8 – You can click on this icon to enable/disable Facebook Live streaming whenever you life before, during or after opening any apps. Leave your comments to know more, or ask anything regarding setup process.